Those who have been around the Apple and Google world for a little while may remember then Apple CEO Steve Jobs promising to go “thermonuclear” on Google after what he deemed to be “grand theft” of the iOS interface in regard to Google’s Android smartphone operating system. There was also the numerous lawsuits that Apple filed against the biggest Android phone maker in the world, Samsung. Apple even pulled Google Maps from its iPhones and built Apple Maps to compete. 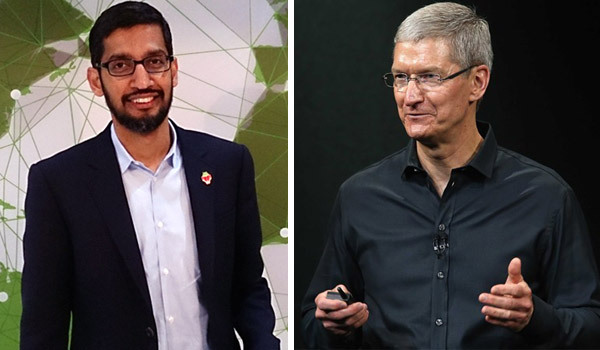 It’s fair to say the two companies were not best of friends, but that may be a relationship that is thawing after Apple CEO Tim Cook and Google CEO Sundar Pichai were photographed together at a trendy Palo Alto restaurant. The pair were photographed multiple times at the Tamarine Restaurant enjoying what appears to be a glass of wine and presumably a bite to eat. The restaurant offers some excellent Vietnamese food, we are told, and while the pair don’t appear to be getting on like a house on fire, things do at least look much more amicable than one would imagine given the souring of a relationship, which was once so fruitful. This isn’t the first time that the heads of Apple and Google have been photographed together during such a setting. 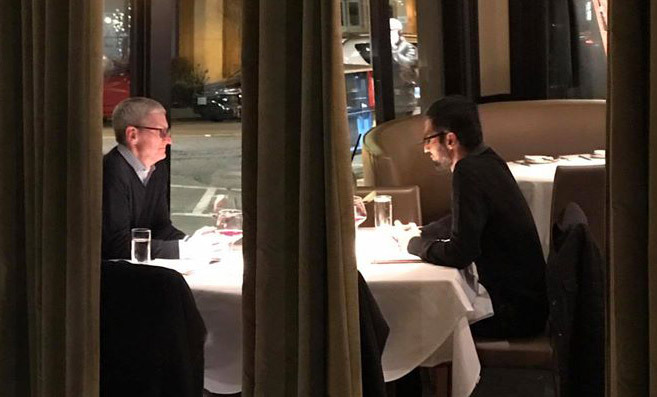 Both Jobs and then Google CEO Eric Schmidt were seen at a coffee shop together during the initial falling out of the two companies a few years ago, and while two high-powered CEOs enjoying a meal together is not necessarily news, we do find ourselves wondering what the conversation would turn to when two people like Cook and Pichai have finished the meals. Perhaps self-driving cars would come up once or twice? Or maybe they discussed the recent Vault 7 publication by WikiLeaks that implicated the security of platforms and services provided by both Apple and Google.